This tutorial uses UsbWebServer 8.6 and SubLime 2. Both of them are free and portable. 1.2) Extract the content to C:\ drive as shown below. Select language and check that green lights appear for both Apache and MySQL. The content of index.php is displayed in web browser. 3) Test your development environment. 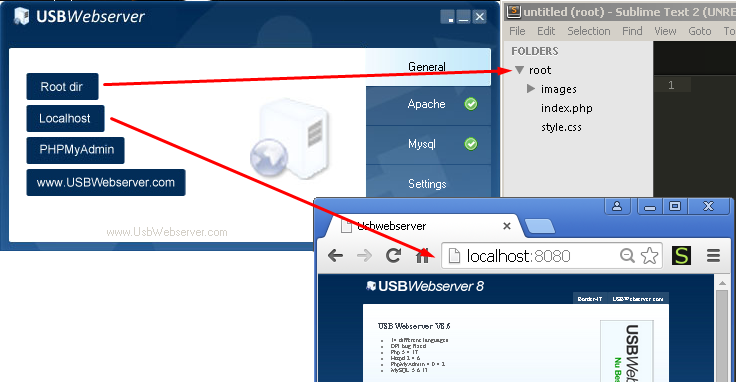 By now, you should be having usbwebserver, sublime and web browser (displaying localhost) running. Look at the item root in Folders Panel. 3.3) Type a name, eg test and press ENTER key. 3.5) Type a basic output statement. Very useful detailed information on learning php in least possible time. especially small and to the point code included in this blog. I am searching such Php questions and answers on google, I found your blog. thanks for helping me.